There has been lots of new Cisco Data Center products released in the past 6-12 months that due to moving country I haven't had the chance to talk about! Hopefully the next upcoming blogposts will change some of that. I have been doing a lot of UC blogposts recently, so here's hopefully a catchup for you on some of the things in Data Center World! Supported count for these blades is 2, 4, 6 or 8. You can't have an uneven number for some reason. Here's the kicker that made me realise the purpose of these servers: they're not intended to run VMWare! These servers are intended for custom applications where you need lots of easily accessible compute resources, where the application itself provides it's own fail-over capabilities. For custom, bespoke applications like this, the ability to add more compute resources, as well as easily replace failed components is paramount. Cisco UCS M-Series enables this! Imagine a world without VMware for a second: imagine how incredibly powerful Cisco UCS Service Profiles would be in a non-VM world, suddenly the statelessness of servers doesn't just make it easier to replace ESX-Hosts after failure. It would have been an absolute game changer. For those companies with bespoke, custom applications that already have their own failover and scaling methods, the UCS M-Series provides the hardware piece of the puzzle, allowing them to easily provision new servers and replace failed servers. For distributed computing or enterprise workloads, all that cooling and power costs money and takes up valuable space. The M-Series allows you to reach a density you simply couldn't reach even with a blade-chassis! To make this possible, A few technologies where developed. The first problem to be solved: All we want in the blade cartridges is CPU and RAM, no local disk and no adapters. I am not sure why Cisco did not consider the use of boot-from-SAN to resolve this problem, perhaps they don't want the applications to rely on boot from SAN? Can I even configure boot from SAN on the M-Series? I intend to find the answers to these questions and will let you guys know ASAP! The table above gives you an idea of some of the options available. From a network-out perspective, the chassis has 2 x QSFP 40 Gig connectors, providing tons of bandwidth out to your fabric interconnects, obviously you would cable from one port to FI-A and the other port to FI-B. What's that I hear you say? But Pete! These are uplinked to an FI and the 6248 series is currently 10 gig SFP compatible only! You can see the slots for the disks (4 per chassis), the Management interfaces, console access, and of course the power supplies and 2 x 40 Gig QSFP+ uplinks. I hope this gives you a deeper understanding and appreciation of the real-world problem the M-Series is trying to solve! It's been a while since I posted my Cisco Jabber huge improvements blog! I even promised you I would explain the new directory options available in jabber! Moving country etc got in the way and their has been a delay but better late than never right? I am also finding more and more customers are asking for jabber, It's no longer the joke compared to Microsoft Lync that it used to be. With collaboration edge and other improvements, it's a great program. OK, on to directory options. The way I often hear this described is that it uses the outlook address book, this isn't actually what happens, the way EDI works is that the client uses DNS to find the local AD global catalog and binds to this using the login credentials of the user. A lot of Windows Applications use this Windows Directory API in a similar fashion. Other than making sure the client is a Windows PC and is actually on the domain, and that the user who is logging in is part of the domain, you should not have to perform much configuration here. This of course assumes your Windows Domain has been setup correctly, but you as the network engineer should not have to do anything to get this going. When you go to "Show connection status" in your jabber client, you will not see any mention of trying to connect to the EDI directory, it will not show up in your jabber client as connected/not connected as it's all part of the Windows API. So keep this in mind! This is the "Traditional" method of LDAP integration with jabber where by you must specify the LDAP server and directory information as part of the service profile for that user. You can create a user who is able to bind to LDAP for this OR you can support an anonymous bind. You can provide this information via the service profile (which is downloaded by the client) or the client configuration file. It prevents you from having to expose your LDAP server to the internet for jabber for iphone etc. you CAN force both internal and external clients to use UDS if for example, your an all-mac shop who do not use LDAP, or your cluster covers multiple AD domains, or any other reason you can think where you would rather use the CUCM database than the AD database to retrieve contacts. You MUST have DNS setup properly for this to work, _cisco-uds must exist and must point to the hostname of the CUCM, the actual hostname of the CUCM (for example, perpub.cucm.com) must be fully resolvable, best bet is to point the _cisco-uds.cucm.com to perpub.cucm.com, which in turn will point to the IP address of your CUCM server. Your jabber client WILL cache these entries, separately from your operating system cache of these entries meaning if at first you forget to setup the _cisco-uds record and then add it later. it still may not work. if you suspect this is the issue your having, be sure to completely uninstall the application from your device and clear out any appropriate folders such as the Application Data folder in Windows for your jabber application. Make sure all the above is correct! UDS simply won't work without all the above being true. Let's see how to configure each of them shall we? As you can see, a directory server hasn't been selected and most of the config is missing, this is perfectly fine if your using EDI, the "Use UDS for Contact Resolution" means that external users who don't have access to the Windows Directory API since they are outside your firewall will automatically use UDS when connecting externally. The features labelled "Only used for Advance Directory" can be used to set filters for the Windows Directory API. This allows you to narrow down the results returned by the Windows Directory Api to just users enabled for Jabber. You could safely leave this alone if you preferred however. So for those of you planning to use a combination of EDI and UDS, your job is complete, so long as your windows domain is setup correctly, for those planning to use BDI, read on! 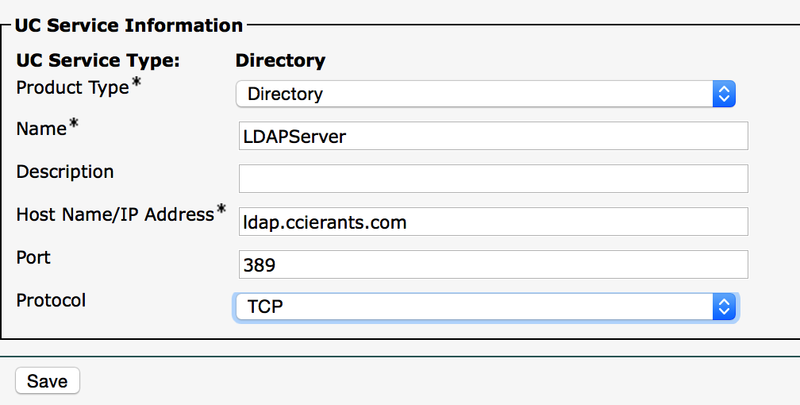 For BDI, you will need to define the LDAP Directory servers, this can be done under User Management -> User Settings -> UC Service. Once this is done, go back to your service profile and select the LDAP directory server you just created. As you can see, in my example above I have created a separate user and assigned that user to be able to read the LDAP directory (must be able to bind to it), the format must be the username@domain format. 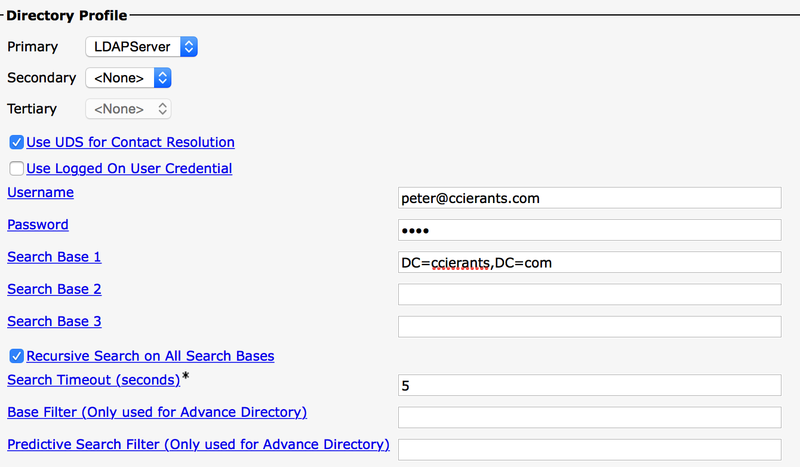 You can also use the users logged in credentials if you prefer, the search bases (which unfortunately their are only 3 of) should be in the standard LDAP format. My advice if your having trouble getting this going is to use jxplorer (http://jxplorer.org/downloads/) to test connectivity. Finally, for some people it may make sense to do away with LDAP completely and strictly use the CUCM directory for contacts. This is done by strictly using UDS. The method to do this requires you make a modification to the client configuration file to force the use of UDS. You can generate a nice config from this, simply unzip the html files and run them in a local web browser, then upload the file to your tftp servers, don't forget to upload it for ALL your tftp servers that your jabber client might use. I cannot stress enough how good this deployment guide is, it has all the information you could ever need. It is quite long but goes down to what version of office you need, failover and just about any other jabber setting you can think of. Blink and you will have missed it, but the CCIE Wireless has been updated to version 3.0! For me, the motivation of setting up Cisco MediaSense was to get Video Voicemail greetings going in Unity Connection, according to a recent Cisco Champions podcast on unity connection this is just step one towards full video messages in unity! You will need some sort of client that can do Video, I used Cisco Jabber but I am sure a 8945 or another appropriately configured Video Device will do the job. First, since we are probably already logged into CUCM, we need to create a user that Unity can use to talk to Mediasense, this is done by creating an end user under the end user page. You don't have to worry too much about the permissions, Standard CCM End User should be more than enough permission. OK, that should be the sum of all our mediasense configuration, what a relief! There is something in the design guide that talks about creating a blanking file to stop the video "freezing" on certain clients, to be honest I didn't have this issue so I skipped this step but if you are having problems with the video freezing at the start of the call or the end of the call check out the design guide for instructions on how to resolve this issue. Let's login to Unity Connection and get this setup. The first step in unity connection is to make sure your Class of Service for your intended video users is set to allow video, scroll down until you see "Enable Video" and ensure you check the appropriate boxes, click save and make sure this applied to the users you want to have Video Voicemail. Simply give the service a display name, the IP address, and the user we configured as a mediasense API user previously, that's it! I personally also checked the "Allow Self Signed Certificate for Video Server" because I don't have a proper PKI infrastructure configured, in production you should get into the habit of doing your certificates properly, see my blog post on PKI with CUCM. Once you have saved this configuration, you will be reminded to restart the Unity Connection Conversation Manager as well as upload the certificate from the MediaSense server to the tomcat trust store on Unity Connection, I am not entirely sure if the "Allow Self-Signed Certificate for Video Server" checkbox makes this unnecessary, but I chose to upload the cert to the store anyway, so let's go through how to do that. 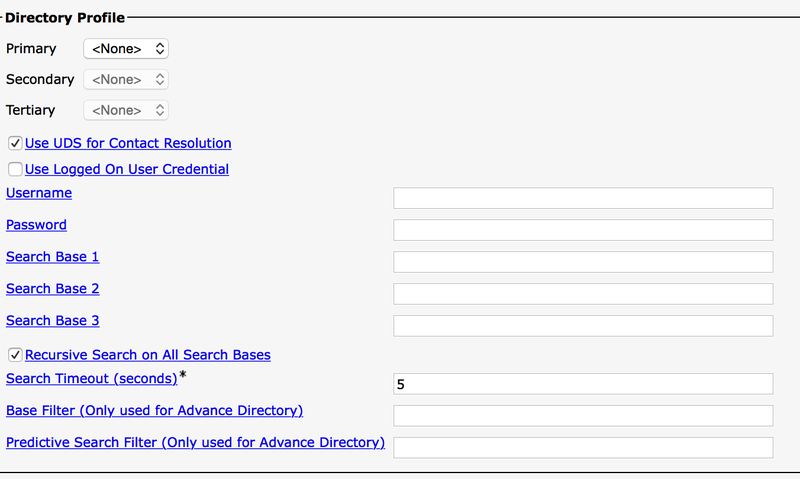 This wil display the security page, Click on View Certificate, then click on the details tab and click export. Save this somewhere on your PC. OK. Now we should be able to press the test button on the video service and make sure everything is OK. Go back to unity connection administration, select your video service you created previously and click "Test"
Hopefully your output looks something like the above! OK, Next we have to make one more change to our user to enable him for video services, you could do this using bulk edit for a bunch of users, OR you could put it into the voicemail template so as you create users this setting will be automatically selected. Go to your user in Unity Connection and Select Edit -> Video Services Account, then click add to assign this video service to this user. OK! Thank goodness you should now be done and dusted. Let's test it! Don't worry! This is normal, the video will only enable as your recording your greeting, (SIP will send an updated SDP message). Once you get to the part in Unity Connection of setting up your greeting you will find that the session changes to support video. Obviously don't forget you will need a webcam if your using jabber so make sure that is working to help avoid troubleshooting an issue that doesn't exist ;).